Does Cone Beam Computed Tomography Make Sense in Your Dental Practice? A dentist explains how he uses his CBCT daily as well as the benefits and limitations of this technology in dental sleep medicine. The cost of cone beam computed tomography (CBCT) is a common barrier to entry for anyone considering investing in 3D imaging. The cost of a new CBCT can exceed $125,000. How do dentists justify such a large investment? The answer depends on the clinician, but for my dental practice, I analyzed the various treatment services I was already incorporating or wanted to begin incorporating in my practice. I purchased my first CBCT in 2014. That allowed me to add services to my office that I’d been reluctant to regularly offer, such as sinus augmentations, guided implant surgery, third molar extractions, complex endodontics, and more. Contact your state dental board before reading or outsourcing any CBCT scans as some states require a license to read the scans. Vet outsourced providers to be sure they have the state license (if needed) and that you are comfortable with the level of education and board certifications of the radiologists who will be reading your patients’ scans. Sleep Nashville, our dental practice devoted entirely to treating sleep-disordered breathing through oral appliance therapy, utilizes 3D imaging through the airway analysis feature of SICAT AIR, which is the CBCT software we use. CBCT can be used in conjunction with traditional screening tools (Epworth Sleepiness Scale, STOPBANG, etc) but should never completely replace these tools to identify high risk individuals. The possibility of a false negative can be created when patients whose airway awake and upright appears adequate in volume but does not take into account the collapsibility of the airway when asleep and supine. Before and after treatment sleep studies remain the standard of care to diagnose and determine treatment efficacy of oral appliance therapy rather than CBCT imaging alone. However, CBCT scans for other routine dental procedures can often identify high risk individuals as an incidental finding that would prompt a sleep study referral. In our practice, we find that CBCT airway visualization helps patients understand how mandibular advancement devices (MADs) are effective at improving airflow. Anecdotally, we show an increase in airway volume of 50% to 100% on average in successful MAD responders. Our CBCT is a great conversation starter with patients in helping understand the need for a sleep study, which furthers our collaborative efforts with local pulmonologists. CBCT used primarily for the screening and assessment of OSA alone is not the most advantageous use of this expensive equipment (due to its limitations discussed earlier). CBCT is not a diagnostic tool for OSA and should not replace polysomnography or home sleep apnea testing in the diagnostic process. 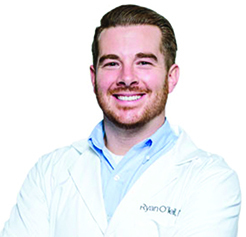 Ryan O’Neill, DMD, is a general dentist in Nashville, Tenn, and owner of Sleep Nashville, a dental practice devoted entirely to treating sleep-disordered breathing through oral appliance therapy. O’Neill lectures nationally on sleep apnea, 3D imaging, and medical billing, and he is an instructor and thought leader for the OPTISLEEP oral appliance. O’Neill has a passion for training and equipping general dentists on how to treat sleep apnea; he offers courses “3D Sleep” and “True Sleep” through True North Continuing Education. O’Neill personally wears an oral appliance, which he says changed his sleep and his life. 1. Buchanan A, Cohen R, Looney S, et al. Cone-beam CT analysis of patients with obstructive sleep apnea compared to normal controls. Imaging Sci Dent. 2016 Mar;46(1):9–16. 2. Camacho M, Capasso R, Schendel S. Airway changes in obstructive sleep apnoea patients associated with a supine versus an upright position examined using cone beam computed tomography. J Laryngol Otol. 2014 Sep;128(9):824­-30.